With Intel Socket 478 Pentium 4/Celeron CPU at 533/400 MHz FSB and 1 GB DDR200/266 (DDR266/333 for LV-670GE) SDRAM of system memory, COMMELL LV-670 offers the high-end industrial computing platform with low cost Intel integrated solution. Intel ICH4 built-in Hi-Speed USB 2.0 controller and onboard IEEE 1394 chipset let COMMELL LV-670 offer up to 480 Mbps of Hi-Speed USB 2.0 and 100/200/400 Mbps of IEEE 1394 interfaces. 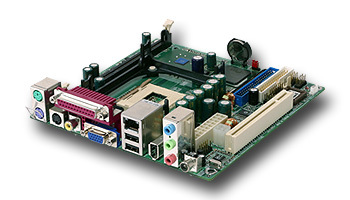 PCI Enhanced IDE Dual Channels support 4 ATAPI devices up to UltraATA/100 with 100Mbps of data transfer rate. One 40-pin and one 44-pin IDE port for both of desktop and slim type ATAPI devices.